Height is a nominal value. 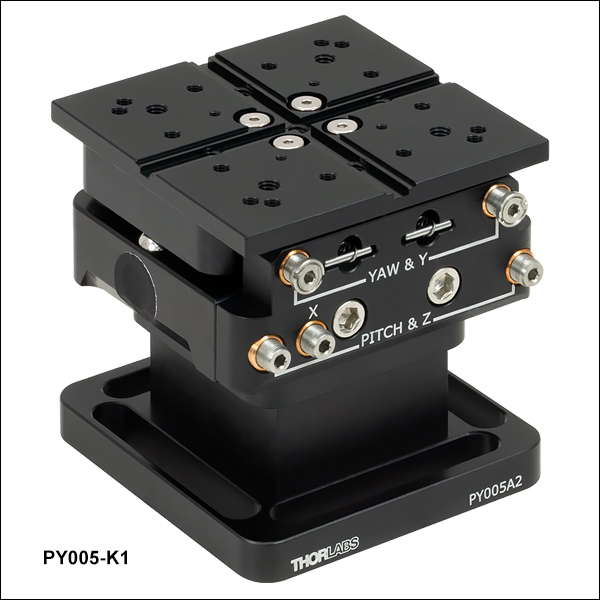 The PY005 stage provides five axes of adjustment in an compact package measuring 2.36" x 2.15" x 1.08" (59.9 mm x 54.7 mm x 27.3 mm). It has five 100 TPI actuators for adjusting the top platform's pitch, yaw, X, Y, and Z positions. 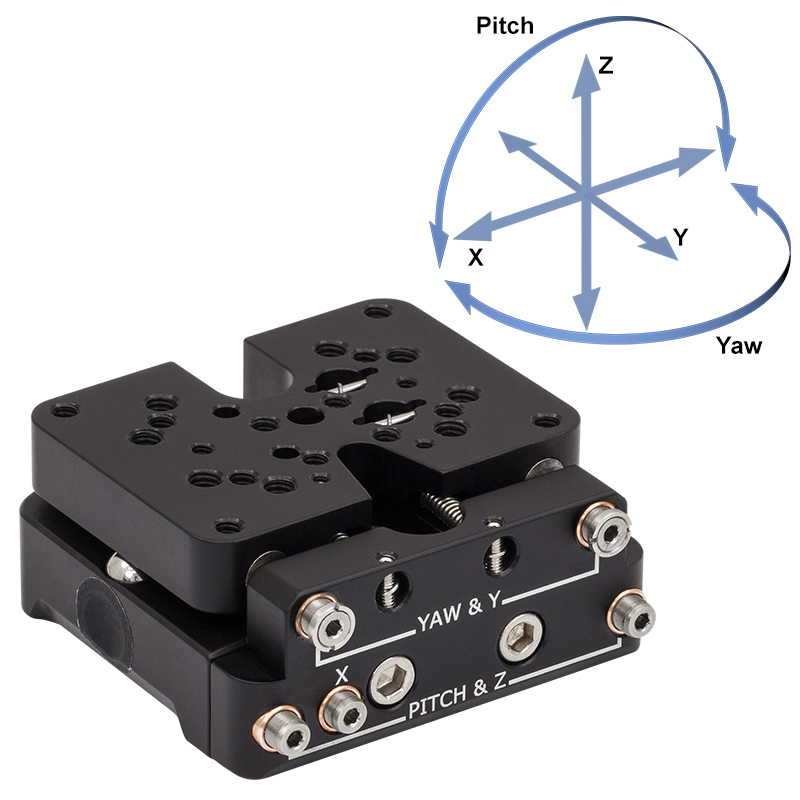 Two actuators together control the yaw and Y-axis position, two actuators together control the pitch and Z-axis position, and a single actuator controls the X-axis position. The actuators have a 5/64" (2 mm) hex for adjustments with a hex key or our HKTS-5/64 hex key thumbscrews. The base of the PY005 has two counterbored 1/4" (M6) slots, as shown in the photographs below, for mounting the stage to an optical table or to the mounting accessories sold below. The translating top platform of the PY005 has a variety of mounting holes and taps that can be seen by clicking on the info icons in the tables below. These holes allow the platform to be used for many different applications. For instance, the eight 8-32 (M4) tapped holes and the #8 (M4) counterbore on the underside of the top platform, accessible from the bottom of the stage, allow optic mounts and other optomechanical components to be mounted on the platform, as well as the PM5(/M) stainless steel clamping arm. 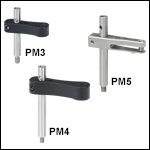 The eight 6-32 (M4) tapped holes are compatible with our PM3 and PM4 clamping arms (sold below). The holes are positioned so that the setscrew of the clamping arm is centered over the top platform. The two 4-40 (M4) tapped holes allow Ø1" optics to be mounted in our 30 mm cage optic mounts (Item # B5C1, B5CT1, or B5CT2). 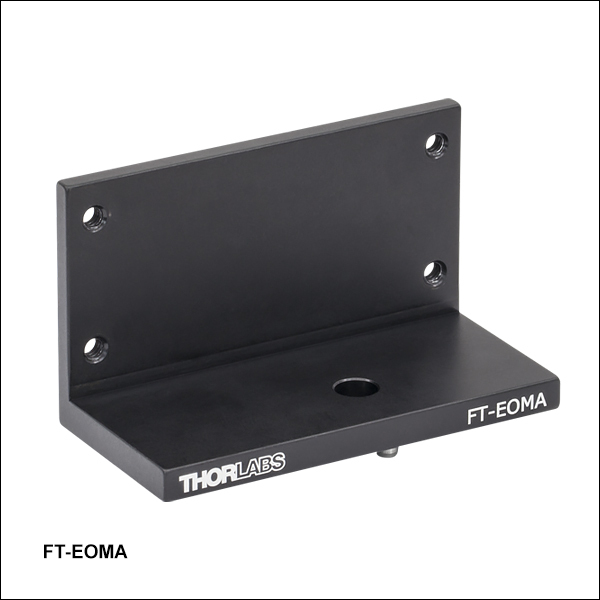 Additional 6-32 (M3) holes make the platform compatible with our FT-EOMA bracket (sold below) for compatibility with our EO modulators. 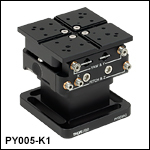 For use with our 3-Axis Flexure Stages, we offer the PY005-K1(/M) adapter kit that includes a pedestal base and flexure top plate. This kit has an overall deck height of 2.46" (62.5 mm) to match the deck height of the stages. We also offer mounting bases to mount the PY005(/M) onto optical tables or breadboards. Why does this separate product (PY005A1) even exist? The translation platform (PY005) itself should already come with something like this integrated. The fact that the underside of the translation platform is not flat presents a lot of problem mounting it on a 1 inch post for instance. Had to resort to homemade hack to get stable mounting on a post. Very bad design from Thorlabs. Thank you for your feedback. The PY005 was designed to have a very compact footprint that can still be mounted to a table using the two counterbored holes, accessible from the top of the stage. 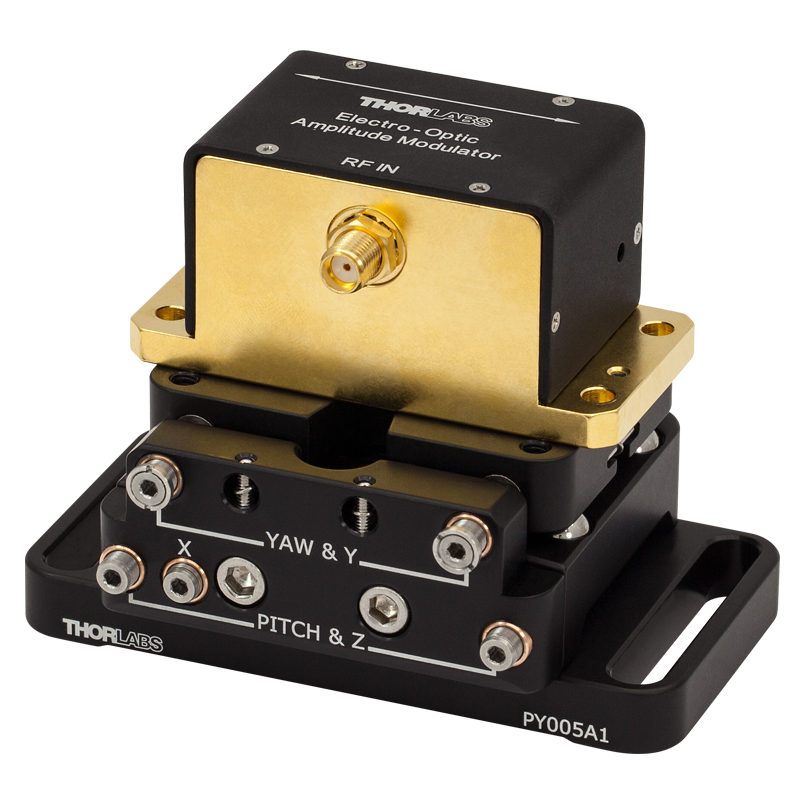 The PY005A1 base adapter is sold separately for those that need more versatility when mounting to a table, but not necessarily the compact footprint. Table mounting was our main consideration when designing this product, as opposed to post-mounting. I have added this idea for a more centered Ø1" post adapter into our internal product forum for future discussion. I also see you did not leave a contact email, so feel free to reach out to techsupport@thorlabs.com with any further comments or questions. Thank you! We aquired 5 PY005/M stages assuming the 5-axis control is independent but it is not, i.e. 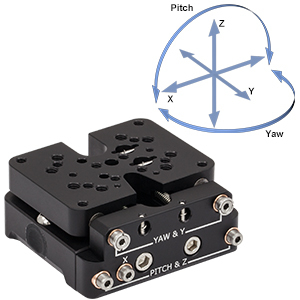 to have Y translation both Y and yaw actuators should be adjusted, the same for pitch and Z. If this can be managed somehow (moving the actuators the same amount), the situation is much worse for yaw and pitch without translation. It would be useful to know where the rotation axes are for pitch and yaw. There is no manual avaialbe for this product. Please make it available, otherwhise what seems to be a nice product is just of little usefulness. Thank you for contacting Thorlabs. Only the X-axis adjustment is decoupled in the PY005. The rotation axes for pitch and yaw depend on the other actuators as well since these are coupled together. These rotation axes are best seen in comparison to the ball locations as well as the springs inside this mount. These can be seen in the 3D model files more easily. I will reach out to you directly for further explanation. What's the maximum load if mounted vertically, i.e. with the adjustment screws pointing upwards? Response from Bweh at Thorlabs USA: We don't have specifications for this configuration. We don't also recommend using the stage in this orientation as the springs are working against gravity either linearly or by a torque on the mounting platform. If you have to use in this way, it should only be with light loads such as a LMR1 with an optic at most. Is there a way to get PY005A2 with a custom height? I would like to use the PY005 for aligning an AOM whose aperture should be at 3". I couldn't find a way to achieve this height. Is there some way to do that? Response from Jeremy at Thorlabs: We can possibly do this as a custom. However, there might be other options available. I will contact you directly to discuss about your requirement. 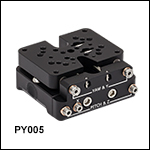 The PY005 is a compact stage with five degrees of freedom. Two actuators adjust the yaw and Y-axis, two actuators adjust the pitch and Z-axis, and a single actuator adjusts the X-axis. A variety of mounting holes are provided on the stage's top mounting platform for compatibility with many of our optomechanical components, including the mounting adapters sold below. A diagram of the mounting holes can be accessed by clicking on the info icon in the table above. 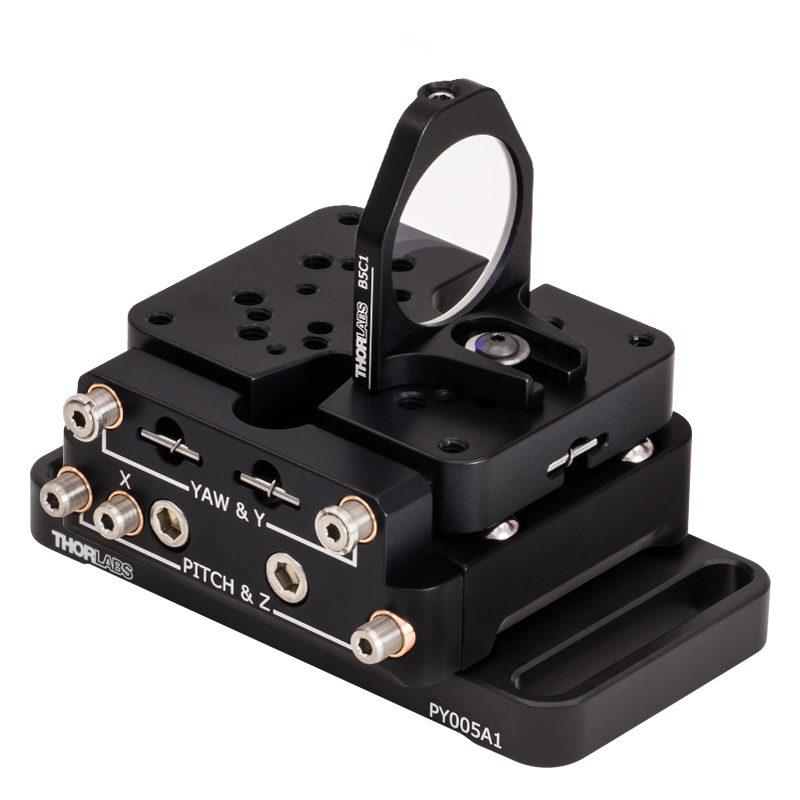 The PY005-K1(/M) includes a PY005(/M) stage, a PY005A2(/M) pedestal base (available separately below) and a top plate that give the PY005 a 62.5 mm (2.46") deck height. The top plate features 8-32, 6-32, and 4-40 taps, as well as a 3.0 mm alignment groove for fiber accessories (please see the table below). For the layout of the tapped holes, click on the info icons in the table to the right. 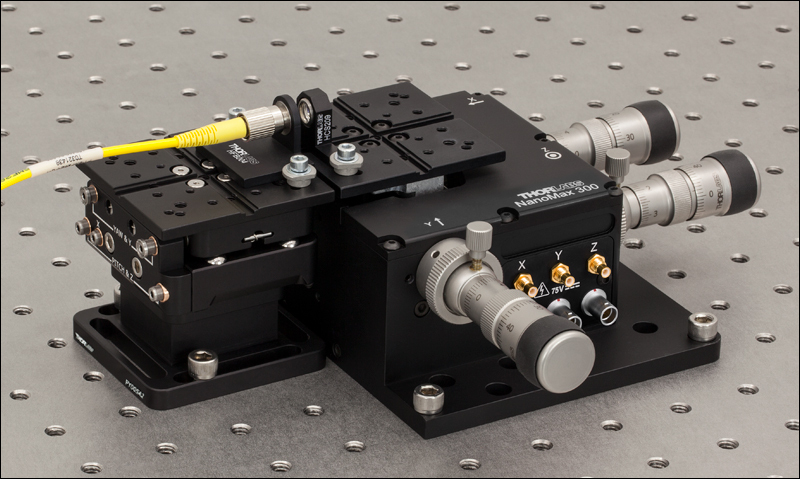 The base allows the PY005-K1(/M) to be mounted to an optical table via four slots and 1/4"-20 (M6) cap screws. 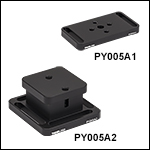 The PY005A1(/M) and PY005A2(/M) mounting bases allow the PY005(/M) stage to be mounted onto optical tables or breadboards. Both bases include 1/4"-20 (M6) cap screws for mounting the stage onto the base. The PY005A1(/M) has two slots for 1/4"-20 (M6) cap screws for mounting onto breadboards. Additionally, instead of using the slots, the base can be clamped onto the table using CL5 table clamps. 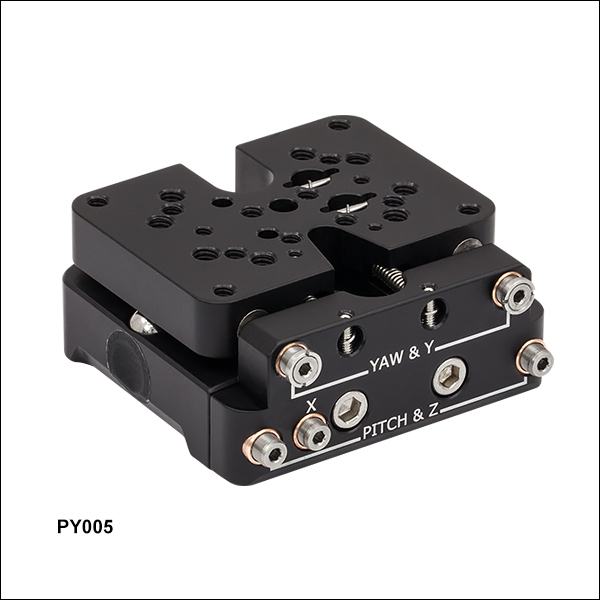 The PY005(/M) can be mounted with the adjusters facing either the long or short sides of the base. When the PY005(/M) is mounted onto the PY005A1(/M), it has a deck height of 1.44" (36.6 mm). 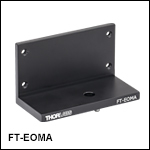 The FT-EOMA adapter allows our free-space electro-optic (EO) modulators to be mounted to the stage. 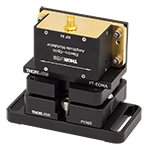 When the PY005A1(/M) and FT-EOMA are used together, the optical axis of the EO modulator is positioned at a height of 2" (50.8 mm) from the optical table. 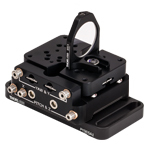 The adapter allows the modulator to easily be taken off the stage without unmounting the stage from the optical table. An EO modulator can also be mounted directly to the PY005(/M) using the #8 (M4) counterbore accessible from the bottom of the stage. This counterbore is accessible even when the PY005A1(/M) is mounted to the bottom of the stage. Thorlabs' Clamping Arms provide clamping force to secure optics to our kinematic platform mounts and V-clamps. The PM3(/M) accommodates optics up to 0.97" tall and features a 0.69" center-to-center distance between the post and the nylon-tipped setscrew that holds the optic. The PM4(/M) accommodates optics up to 1.61" and features a 1.16" center-to-center distance between the post and the nylon-tipped setscrew. 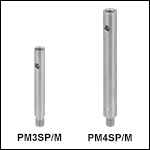 The maximum optic height of the PM3(/M) or PM4(/M) Clamping Arms can be extended using our PM3SP(/M) or PM4SP(/M) Extension Posts, respectively. These extension posts are identical to the posts included in each complete clamping arm. Each clamping arm features 6-32 (M4) threads. 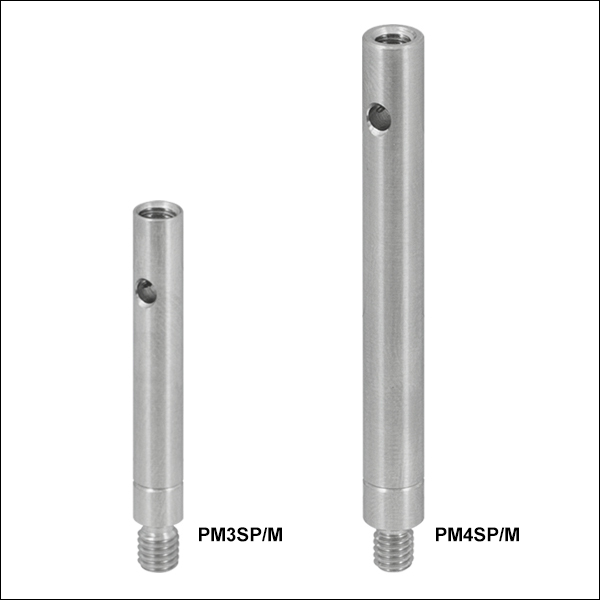 The PM3 and PM4 can be mounted in 8-32 tapped holes by using the AS6E8E thread adapter, which features internal 6-32 threads and external 8-32 threads. The thread adapter is designed with the same outer diameter as these clamping arms and extension posts for seamless integration. 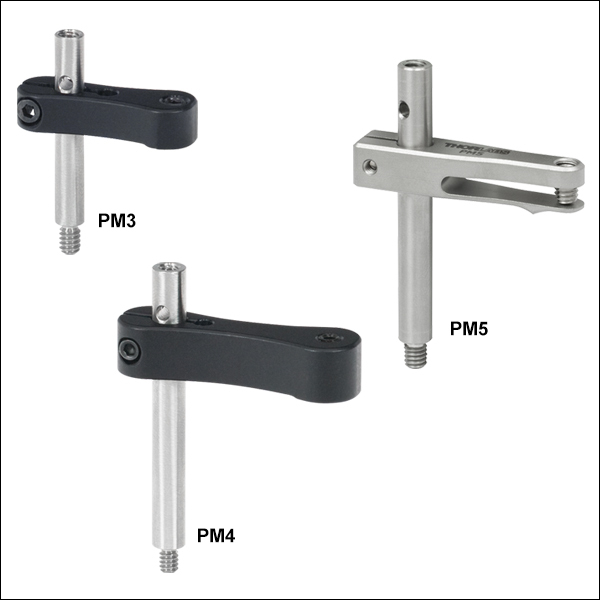 The PM5(/M) clamping arm is made entirely from heat-treated stainless steel, which helps maintain stability in fluctuating temperatures and provides vacuum compatibility. This clamping arm is recommended for use with the POLARIS-K1M4(/M), but it can be used with any platform mount that has one or more 8-32 (M4) tapped holes. The PM5(/M) can hold optics up to 1.65" tall, and the distance from the post center to the contact point that holds the optic is 0.90". Each clamping arm is attached to its post using a flexure mechanism that locks with a 5/64" (2.0 mm) balldriver or hex key. The setscrew on top of the clamping arm also accepts a 5/64" (2.0 mm) balldriver or hex key in order to clamp down on the optic. The post includes a through hole which can be leveraged for added torque when tightening down the post. Please see the diagram above for additional information.